Creating comic hero icons can be a challenging task while covering all the DC and Marvel Superheroes and the lesser known ones who have not yet been featured in Hollywood flicks. But in our Comic Hero Icon collection you can find almost all of them in different forms, colors, patterns and formats. These new era of icons have come to redefine website templates, mockups, app pages and personal collections. This is a golden opportunity for all graphic designers to complete their superhero/ comic hero icon collection without spending a fortune. With options of different formats like PNG and SVG, we have also included various color options which allows you to download the same logos in different hues. They come in grayscales, full bleed colors, texturized hues, retro touches and much more. You can also download just their logos, weapons or insignias from out comic hero icon collection. All the icons are flat and responsive; they integrate seamlessly with the new HTML5 and CSS3 website templates. The entire collection of comic hero icons is free and does not involve any copyright hassles. You can edit the Vector PSD files on Adobe Photoshop without paying a dime and create your own designs or icons. The multiple icon collection is ideal for all new and veteran graphic designers who want to explore new avenues in designing. 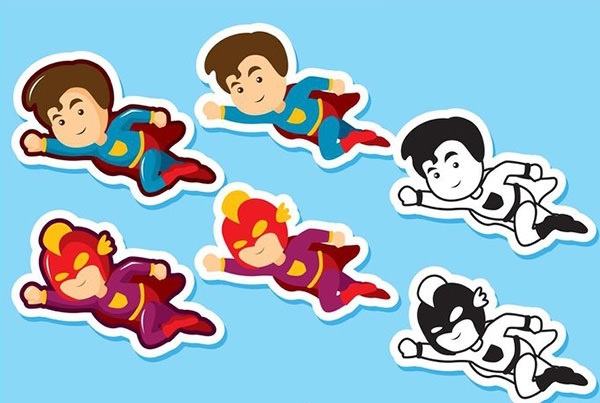 You can add these icons to website designs, backgrounds, blogs, your own comic books reviews, comics inspired designs, create avant-garde designs with wonderful flat and free comic hero icons.